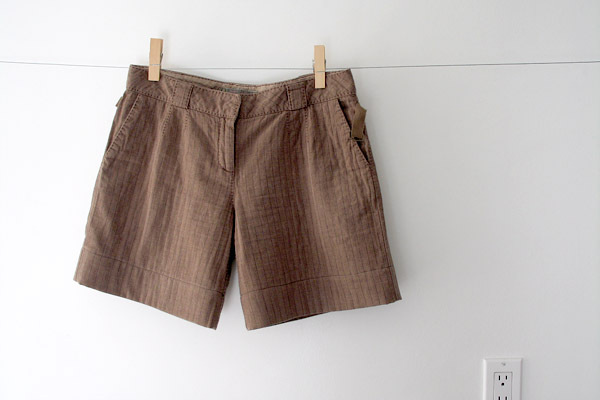 I wanted to buy some shorts after looking at way too many spring clothing catalogs but then I realized, I can make them! I just cut these pinstripe wide-leg pants that have been hibernating in my closet, sewed, and voila! Well, it took longer than it sounds because I'm not so skilled in sewing but it was theoretically very simple. Speaking of reusing, check this site called reknit (via idsgn). You send an old sweater and it gets unraveled and reknit into a new item like a hat. Cool! I'm going to try to continue this series of "I Made" posts so that I use what I already have and spend less money on shopping. Now, what's next?? *standing in front the closet with a pair of scissors* OMG!